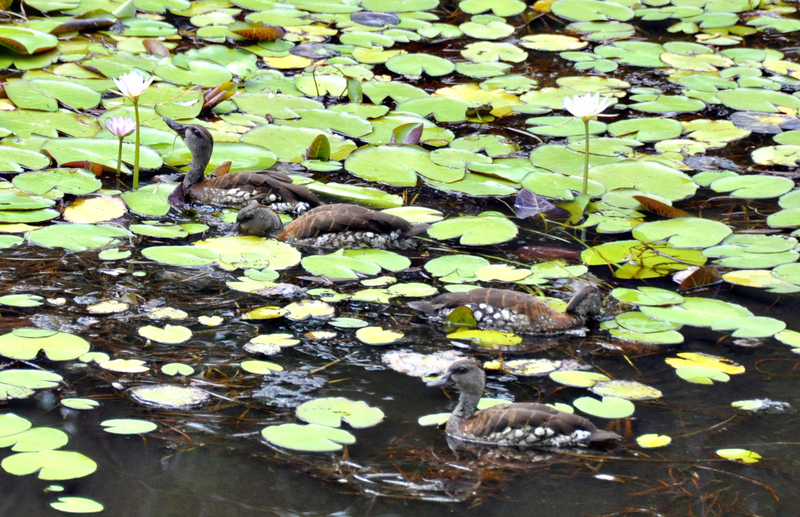 We first encountered these unusual ducks in Mungan Kundju National Park in 2009. At first we were totally baffled as to their identity but a quick study of our Field Guide, Pizzey & Knight, gave us the answer …….. 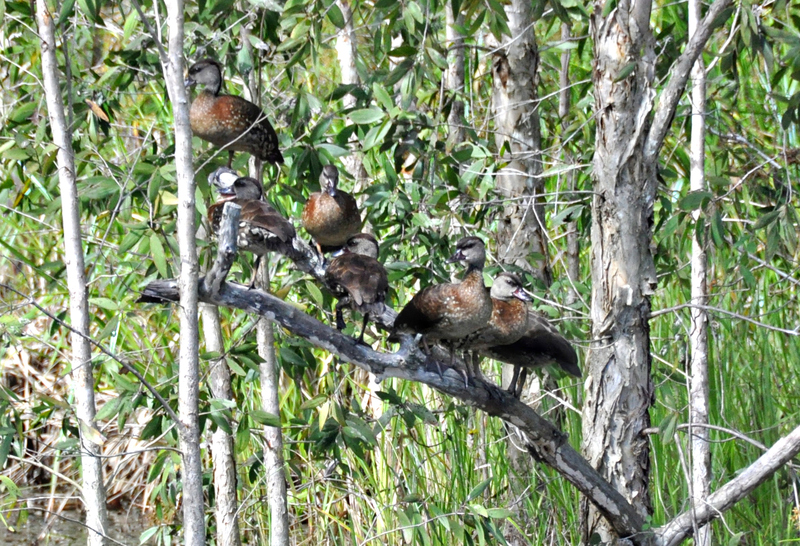 Spotted Whistling Ducks are native to Philippines, East Indonesia, PNG and Bismarck Archipeligo. The first sightings in Australia were apparently at the Weipa sewerage farm in 1995. They are now regular and breeding at Weipa and also at Coen and Mungan Kundju N.P. is only just a little north of Coen. As the ducks were on the other side of a large lake we only had a distant view and a very poor photo but felt generally quite pleased about our sighting. 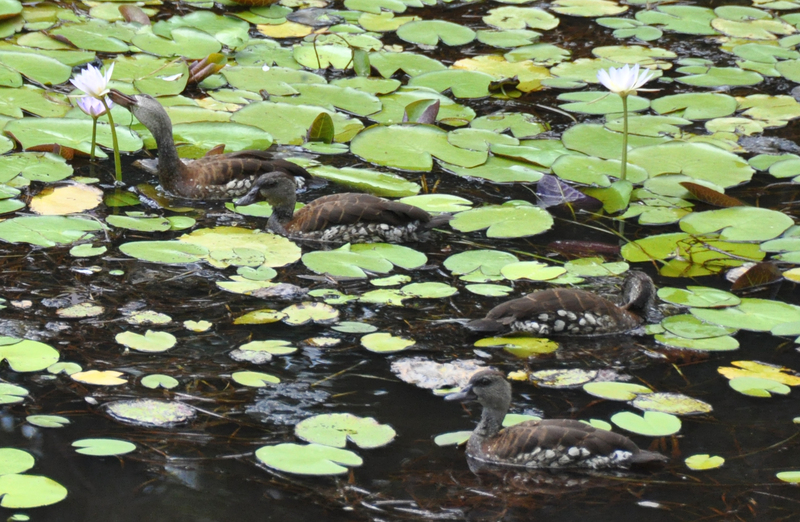 Last September 13 Spotted Whistling Ducks were observed on a pond at Wonga (about 10 km north of Mossman) and since then they appear to have been frequenting a variety of swamps and dams in our area. When we were returning from our weekly shopping expedition to Mossman yesterday we saw them in flight when we were about 10 minutes from home. We have been seeing them regularly on our ponds or perching in low branches overhanging water but when they flew in this morning I only counted 10 . They are quite approachable, although they will keep completely still while assessing a situation with normal behaviour resuming within a minute if all seems well. They are very well camouflaged when totally still! There is a considerable amount of water weed in our ponds and we’re very happy to see the ducks enjoying it. Although sometimes its nice to have a bit of variety! And they also like to perch on branches overhanging the water. This entry was posted in Bird Observations and tagged Spotted Whistling Duck. Bookmark the permalink. Has it been reported to Birds Qld? It was reported in September as it was thought to be the most southerly sighting – at least one person I heard of travelled from Sydney especially to see them! Re ‘Field of Dreams’ we’re just pleased that we’ve managed to create a habitat which is appealing although having said that we often see Egrets, sometimes Black-necked Stork feeding on what we would regard as fairly degraded land. Birds don’t necessarily appreciate aesthetics, only food! It’s fantastic having them on your doorstep. Love that two shot sequence of the duck contemplating and then nibbling the flower. Yes I was quite amused by that nibble on the lily as I’d been out in the canoe to do some weeding a couple of days ago and I’d noticed a couple of damaged lily flowers and wondered what had attacked them. I think I may have the answer now. Beautiful ducks and your habitat is really great. Any ideas why the range of these birds is spreading south? Its difficult to know why these birds are spreading out Mick, I suppose we’ll have to wait and see whether they breed in the local area before we jump to any conclusions. I’m looking forward to giving them a Tyto tick in 2013-4!